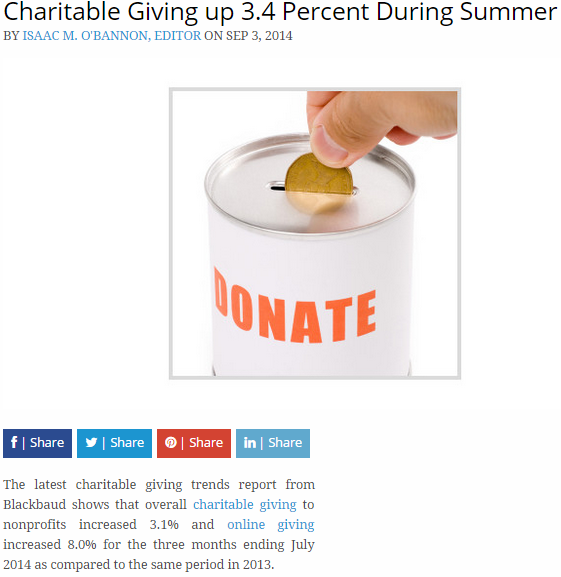 The latest charitable giving trends report from Blackbaud shows that overall charitable giving to nonprofits increased 3.1% and online giving increased 8.0% for the three months ending July 2014 as compared to the same period in 2013. The increase, which extended up to the latter days of July this year, came off the heels of massive increases a year before. According to an infographic by Blackbaud, 2013 saw an almost 5 percent increase (4.9 percent) in overall charitable contributions, alongside a huge 13.5 percent increase in online donations alone. Of all the organizations involved, international affairs organizations were the most active in terms of overall giving with a 13.2 percent increase. The previous year alone has seen a huge boom in terms of overall charitable contributions from both organizations and individuals alike, with the latter being the single largest contributors. Overall, donors donated some $335 billion. In other words, people are becoming more and more generous, and giving itself has become the “in” thing to do. But one might ask, “Why are charitable contributions gaining popularity, anyway?” To answer this, one could point to the innovative ways charities are using to entice people to give. A good example would be the wildly popular cause furthered by the ALS Association, called the Ice Bucket Challenge. The ALS Association is a non-profit organization dedicated to finding ways to cure Amyotrophic Lateral Sclerosis (ALS), a disease that causes a victim to lose control of all voluntary muscles. To date, the Ice Bucket Challenge’s innovative and rather amusing premise has enticed people to unite in a single cause and donate over $88.5 million for ALS research funds, and it’s not likely to slow down any time soon. However, aside from the theatrics the Ice Bucket Challenge and other similar charitable causes have, there are deeper reasons behind conventional monetary contributions and activities such as NY car donation drives alike. There are two major motivations for charitable contributions: recognition and internalized moral values. People choose to give either to be acknowledged, or as a way of expressing their moral beliefs, or even a blend of the two. At the end of the day, charities could surely use some help from those who wish to give, no matter what drives them to perform such deeds, and no matter which form the donations take.